The End of Your Life Book Club won “Best Inspirational Memoir” at the Books for a Better Life Awards! Linda Greenlaw sat down with the Boston Globe and offered lovely praise for The End of Your Life Book Club during her interview: “When I read I want to sit down and sail through a book. 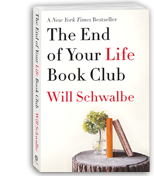 The last thing I really enjoyed like that is The End of Your Life Book Club by Will Schwalbe.” Read the full interview here. The New York Times Book Review on the continued success of The End of Your Life Book Club on the NYT best seller list — check it out here. Will Schwalbe is headlining the Friends of the Library’s 44th annual Book and Author Luncheon, along with Pulitzer Prize finalist David Nasaw. The luncheon will take place in Manhasset, NY, on Friday, May 17. Find out more here and get tickets here. Minnesota’s Hutchinson Leader calls The End of Your Life Book Club a “noble book” — read the rest of the review here. Will Schwalbe was recently interviewed for WTIP 90.7FM, Minnesota community radio. Listen here to his conversation with Buck Benson on The Roadhouse. The End of Your Life Book Club was reviewed recently in Oregon’s Mail Tribune. Check out Will’s interview with JD Roberto on The Better Show!